Microorganisms that cause colds, flu, cold sores, gum disease, cavities and even hepatitis thrive and multiply on your toothbrush? Be sure to keep bristles separated from those of your friends and family members! Replace a brush after any illness or every three months to help prevent cross contamination! 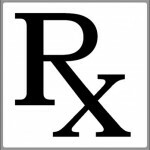 The abbreviation for a prescription is “Rx” and comes from a Latin term meaning recipe. A prayer to the god of medicine, Jupiter, was said in hopes of good health. This symbol is still used today on prescription pads. The fear of teeth is called odontophobia!